Terrorist threats and air rage incidents aboard commercial airlines present a high level of risk to the safety of passengers and aircrew. AD Aerospace’s CabinVu is a sophisticated video security system used for the prevention of air rage and terrorist crimes, by increasing the information available to pilots and crew. The CabinVu system consists of a series of covert and overt CCTV cameras, trained on the cockpit door and forward galley, and a dedicated, live viewing LCD monitor in the cockpit. Flight deck crewmembers can see what is happening immediately outside their cockpit during flight, assess the situation as potential hazards arise and restrict access to the appropriate personnel. This is in line with recommendations from ICAO Annex 6, EUROCAE ED-123 and provides compliance with EU-OPS 1.1255 Sub Part S, FAA 14 CFR 121.313(k) and 14 CFR 121.584 (a). The overt cameras also work as a deterrent and reduce the chances of an incident occurring. Monochrome cameras and infra red illuminators are used to enable the pilots to view the cabin when the cabin lights are dimmed for night-time conditions. 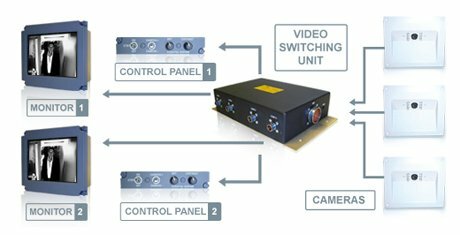 The video switching unit can link to any combination of 1 to 8 cameras, 1 to 2 monitors and 1 to 2 control panels allowing for maximum flexibility to fit an airlines needs depending on the configuration of the aircraft. FlightVu CabinVu is part of the more comprehensive security system FlightVu Witness and can be fully upgraded to this system, with the inclusion of a video server and additional cameras, which monitors the whole cabin and digitally records images for use in courtroom prosecutions.This means that the pilots can visually identify anyone requesting entry and take appropriate action should an incident arise. This is in line with recommendations from International Civil Aviation Organisation ICAO Annex 6, EUROCAE ED-123 and provides compliance with FAA 14 CFR 121.313(k) and 14 CFR 121.584 (a) and with the forthcoming EU-OPS 1.1255 Sub Part S.